Valentine’s Day is this Friday! If you are still looking for gift ideas I have a few to share from Fannie May and appreciate them sending me a box of chocolates to review. I shared around the Holidays how chocolates were my go-to gift to give and the same is true for gift giving around Valentine’s Day. Since most people love chocolate as much as I do it’s an easy gift to give. When I received the box of chocolates last week, Jacob was excited to see all of the candy. Every day he has been picking out one to try and we take guesses as to what is inside the chocolate coating. It’s a special moment between the two of us and something we both look forward to each day. Giant, hand-picked strawberries are generously dipped in creamy white and pink champagne-infused real chocolate and decoratively sprinkled with gold, platinum and clear sugar. 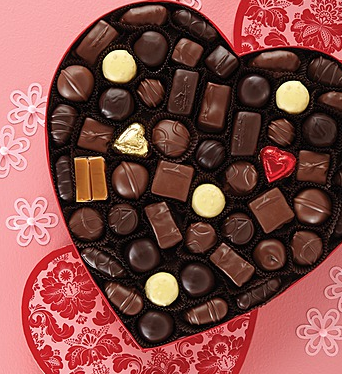 Assorted Chocolates – Heart Box, 2 lb. Milk chocolate, dark chocolate or a combination of both, this essential assortment has something for everyone, from buttercreams and rich nougats, to buttery caramels. This is the box of chocolates that we received from Fannie May. I love the caramels and Jacob’s favorites are the wrapped chocolate hearts. They are housed in a beautiful box that makes this the perfect gift to give! A selection of favorite confections for your Valentine, each Loving Favorite Gifts Tower weighs 2 lbs, 9 oz and comes filled with: 4 oz Valentine Pixies, 1 lb Delights Individually Wrapped Chocolates, 5 oz Milk Truffle Hearts, 4 Milk Grahams, 4 Milk Cookies, 4 Milk Pretzels, and 4 White Pretzels. Yum! If you have multiple people on your gift list you could even split this one up and give the boxes in the tower out to separate people. Shipping Note: The website says if you order by today (2/11 at 3pm EST) you can use ground shipping and get the gift to your Valentine in time. Waited until the last minute? You can still order and choose overnight delivery on 2/13 for delivery on 2/14 or visit one of their Chicago area stores.